Some days, you just want to be as close to the sunshine as possible...Chris gave Cam a lift out hi s sunroof to see if he liked feeling extra tall. After soaking up the rays, Cameron and his Dad were off to pick up a Mother's Day gift for Jane. Jane and her boys started off the day by dining out and enjoying a delicious breakfast. The afternoon included a long walk with a short stop at a favorite ice cream venue. Chris & Cam presented Jane with a unique hand-crafted vase dep icting a Lake Michigan scene. The beautiful flowers they picked out lo oked perfect in the pottery! 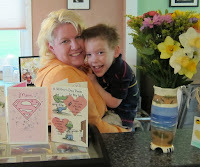 Jane loved her cards from her two special boys. 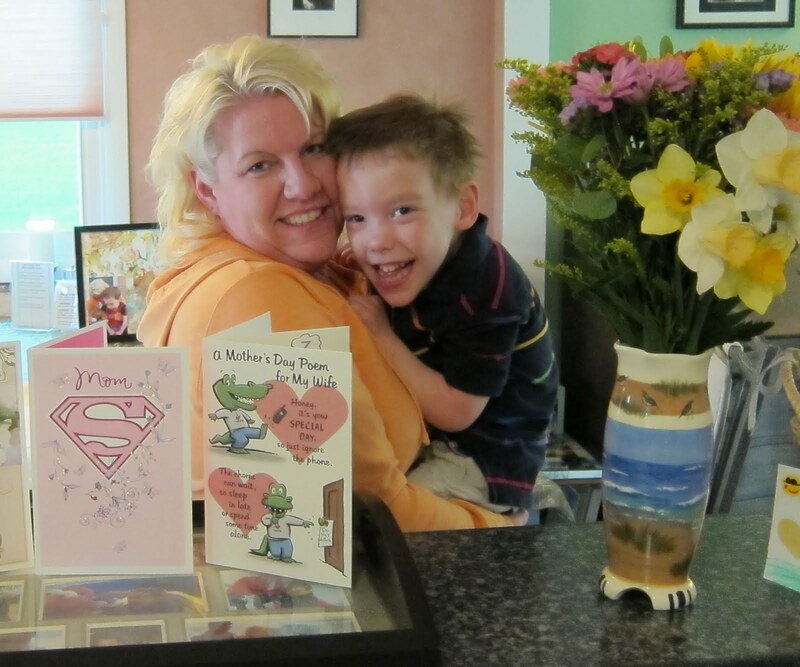 At school, Cameron had made his Mom a memorable art treasure complete with his hand print and a sweet poem. A beautiful picture serving tray and goodies basket was Jane's Mother's Day gift from Cam's Grandma, a most wonderful Mom herself. After such a busy weekend, one of Jane's favorite moments was a simple one...the gift of relaxing with her boys!